Do you take this man as your lawfully wedded husband? Every girl, since she is little, has dreamt of her wedding day. It is a big event in every woman’s life. A bride becomes the cynosure of every one’s eye and all she dreams of is looking the best on her special day. With months ahead of wedding preparation, one place every bride to be can run for inspiration and ideas is Bollywood. From entertainment to fashion, Bollywood is the house of inspiration for all. The real life Bollywood weddings sparkles with glitz, glamour, and opulence. If you are a big Bollywood fan like us, then any news of a Bollywood wedding would surely pique your interest. Over the years we have loved the bridal dresses worn by our Bollywood divas and we have curated the 10 Best Bollywood Brides that have stolen our heart. Take a look and bookmark this post for your D-day. The biggest celebration of the year 2016 has been Bipasha Basu’s monkey wedding. 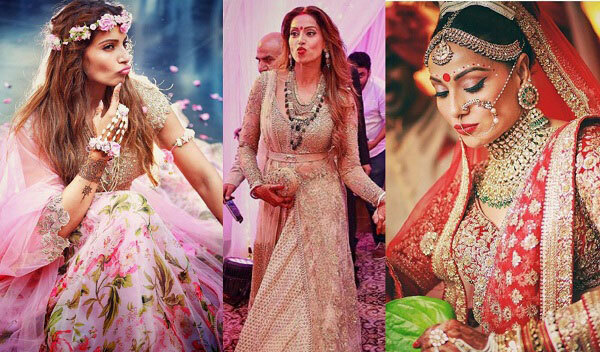 From pre-wedding mehendi ceremony to reception, Bipasha Basu nailed every single look. For the D-day, the happy Bong bride wore the very famous Sabyasachi Mukherjee bridal lehenga that speaks of grandeur and elegance. The red lehenga and quarter sleeve blouse was embellished with heavy zari work and matching Kundan jewelry from Jaipur. It made Bips look no less than a goddess. She wore a pastel pink lehenga and floral jewellery for her mehendi and looked ravishing. Total #bridegoals, Mrs. Singh Grover also wore a beautiful beige lehenga and kundan jewelry with her makeup on point for her wedding reception. Who said only brides look good only in reds and pinks on their wedding day? Take cues from Aishwarya Rai, who looks regal in a traditional gold Kanjeevaram saree designed by the bride’s favorite designer Neeta Lulla. What stole our heart is the adornment of Swarovski crystals and pure gold threads on the bridal saree. She indulged in 22k gold armbands, gold hair accessories and Kundan jewelry that enhanced Aishwarya’s wedding ensemble. Mrs Bachchan totally rocked the south Indian Bride look! Shilpa’s perfect body and height has always made heads turn. So it’s no surprise that her wedding pictures and exuberant outfits made us go gaga! For her wedding with Raj Kundra, Shilpa wore an all red saree with 8000 Swarvoski crystals, costing a giant 50lakhs. Stunning as ever, Shilpa Shetty Kundra chose a pre-draped beige and golden saree with diamond jewelry for her wedding reception. Perfection we say! 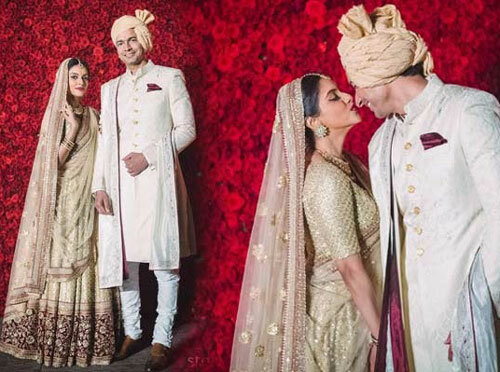 Even though it’s been a long time since Genelia D’Souza got married to Ritesh Deshmukh, her bridal ensemble designed by Neeta Lulla is still graceful as ever. 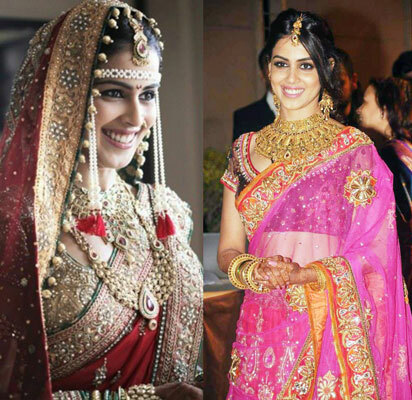 Genelia wore a traditional, timeless red saree bejeweled with golden Kundan work. Her diamond jewelry and colorful bangles made her look perfect for her Maharashtrian wedding. Kareena Kapoor just wins our hearts, every single time. 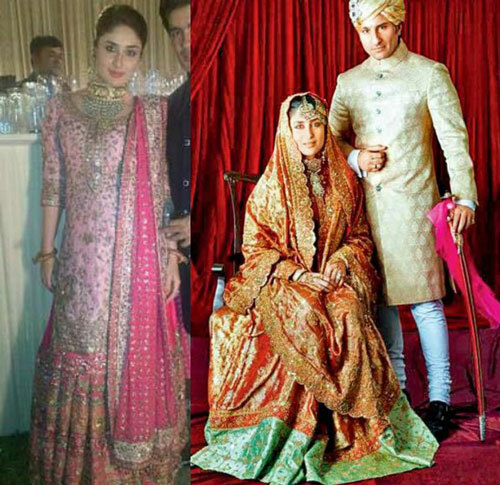 For her wedding, the Pataudi Bahu wore her mother in law- Sharmila Tagore’s bridal ensemble which was restored by fashion designer Ritu Kumar and undoubtedly Kareena looked ravishing in the vintage pink bridal sharara. The choker necklace added an elegance to the stunning bridal ensemble. For her reception, Bebo wore a burgundy lehenga but Manish Malhotra paired with tonnes of kundan jewellery. When we heard that Asin’s fiance surprised her with a 20 carat engagement ring worth Rs.6 crore, we knew her wedding would be a royal affair. Asin had a Christian and a Hindu wedding and looked spectacular in both the ceremonies. For the Hindu wedding, Asin was spotted in the pastel pink bridal ensemble from Sabyasachi. She accessorized her outfit with royal antique jewelry that accentuated her beauty. She opted for a soft makeup look with bold berry lips and winged eyes. 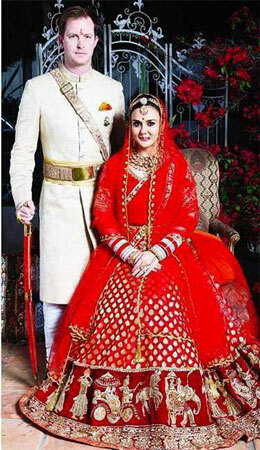 Preity Zinta and her husband Gene Goodenough look picture perfect in their royal outfits. She wore a quintessential red Manish Malhotra lehenga which screams grandeur. We bet you can’t take your eyes off from the rich ethnic hemline. She accessorized her wedding outfit with dazzling Kundan jewelry, matha patti which further enhanced the royal look. Speak of alluring and Urmila Matondkar’s bridal ensemble is the one that comes to our mind. The melange of pink and red in this bridal lehenga from Manish Malhotra’s Regal Thread Banaras collection made her look vogue-cover worthy! The outfit was designed in just 5 days and only Mr Malhotra could’ve done such a splendid job in this short duration. We loved the fusion of vibrant colors, stunning gold jewelry, and traditional Maharashtrian green bangles. Urmila totally slayed on her wedding! 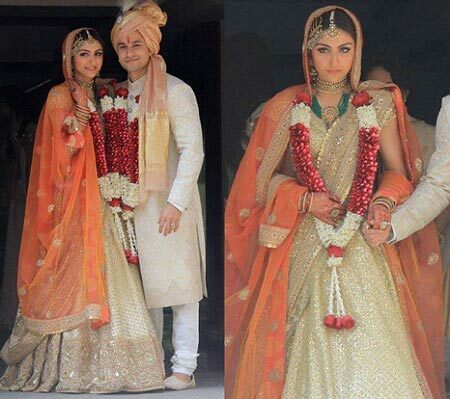 Pastel-hued bridal ensemble is trending big time and Soha Ali Khan definitely gives us major inspiration for a day wedding. The Sabyasachi beige lehenga with peach dupatta speaks of charisma and tastefulness. Her perfect makeup and regal jewelry complements the ensemble perfectly. If you look at Gul Panag’s wedding pictures, you would notice how enthusiastic she looked on her D-day. For her special day, Gul wore a J.J Vallya designed rani pink lehenga with detailed golden zari work that looked vibrant and stylish. Her antique jewelry and heavy karelee completed her Punjabi bridal look. So these were the 10 Best Bollywood brides and their stunning wedding dresses. Do let us know which of these look mesmerized you in the comments below.